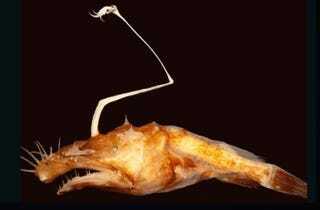 The deep ocean is home to some of the ugliest creatures imaginable, so this newly discovered anglerfish, which looks like a radioactive turkey leg with a spiny mouth face, is fitting in just swimmingly. The creature, which has been placed in the genus Lasiognathus, was discovered in the northern Gulf of Mexico 5,000 feet beneath the surface, by a scientific expedition that was investigating the impact of oil spills on deep sea life. That demented head-arm, which looks a bit like a retractable selfie stick, may actually be a fishing pole of sorts, complete with a faux-fish lure on top. Amazing indeed. It’s hard to imagine something this hideous existing in a world where the sun shines. But deep sea life can be forgiven for its ghastly appearance: After all, these creatures hardly ever have to see each other. And hey, after enduring 2,200 pounds of pressure per square inch your entire life, you’d probably look a bit worse for the wear, too.